Cindy Needham: Meyers Street Studios...Finally Open!!! I recently posted that my oldest daughter, Jenny, and I had secured shared studio space right next door to my youngest daughter's bakery. We have been working our tails off for the past two weeks getting the walls cleaned up and painted and getting everything in order and I thought you would enjoy seeing the process! A complete paint job was in order as the walls were SOOOO bad. Seems like there were hundreds of holes to fill. I painted the "big stuff" and left the important details on the ladders and the trim to Jenny. Remember Miter? The dog who ate my quilt??? Well he's still around but much older. He kept the couch warm while supervising. 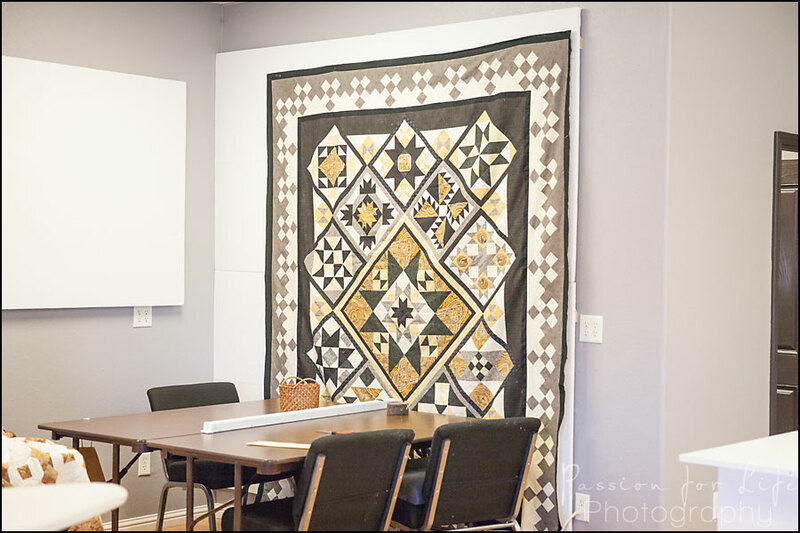 One very important part of any quilting studio are good design walls. Thank goodness for my cabinet maker husband, Kent. Since this is "shared" studio space these design walls need to be removed when I don't have students as this doubles as Jenny's photo studio. Kent attached a heavy angled molding to the walls to hang the boards on. These are the boards before they were wrapped. This is 3/4" foam insulation sheeting from Home Depot. They are 4' x 4'. He attached the mate to the angled molding to the top of each board and then added two more boards to keep it stable. My good friend, Beth, and I spent a couple hours wrapping each board in Warm and Natural batting and then each board hangs on the molding on the walls. 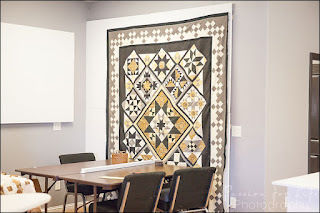 This allows me to add as many walls as I want and once class is over the boards are easily taken down and stored in the back room. The other REALLY cool thing Kent did for me was to build six of these rolling cabinets. They are elevated to a good working height, oversized top holds a large cutting matt and it's just the right size for basting a quilt. Open storage underneath allows me to store my supplies and extra machines and keep everything neat. These cabinets can be rolled together and the wheels locked in place to create any size workspace for basting or marking. 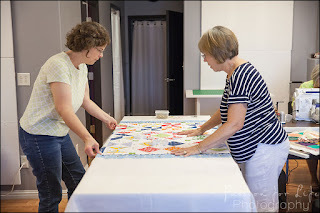 Beth and Kathy rolled two of these cabinets together to create a nice long table to baste this quilt. LOVE these cabinets!!! 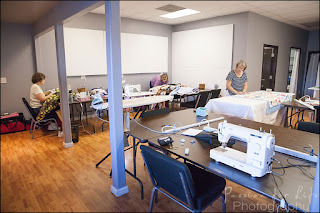 I had a little Sew Day on Sunday to test the space out and see how it all worked and it was wonderful. I am really looking forward to many, many more classes and workshops here! When I'm not teaching here the room is all cleared out and Jenny can setup her back drops and has the whole space as her studio. It just doesn't get much better! Congratulations. Meyers Street Studio looks so inviting. I look forward to visiting and taking a class or two. Think of how much fun it would be to attend a class, or retreat, and have a professional photographer take a picture of our quilting. Way fun. Looks like an ideal arrangement!!!! The space is awesome and Kent really is great to help with those carpenter tasks!!!! OH that looks marvelous, Cindy! And how special to be with your girls! What a freakingly awesome studio! Wish I had been there for the christening and had my share of thread on the floor. Lucky you. It looks wonderful! 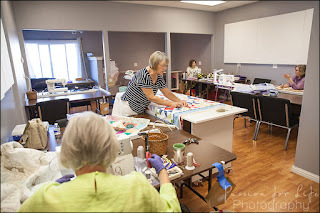 I hope I get to take advantage of one of your workshops in your new space. I'm so happy for you.